With its unique vintage casual style, this bar height swivel stool offers comfort with a great look. It features mixed materials with a metal back and footrest, brown faux leather swivel seat with accent nail head trim, and wood base and curved cap rail. The Pinnadel Tall Upholstered Swivel Barstool with Wood & Metal Backrest by Rooms Collection Three at Rooms Furniture in the Houston, Sugar Land, Katy, Missouri City, Texas area. Product availability may vary. Contact us for the most current availability on this product. Seat Brown Faux Leather Cushioned Swivel Seat with Nailhead Trim. 180-degree swivel. Update your casual dining space with one of the vintage casual style pieces from this collection. 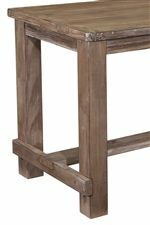 The select pine veneers and solids in a wire brushed gray brown finish provides a complementary look to the variety metal accent bar stools. The Pinnadel collection is a great option if you are looking for Casual furniture in the Houston, Sugar Land, Katy, Missouri City, Texas area. Browse other items in the Pinnadel collection from Rooms Furniture in the Houston, Sugar Land, Katy, Missouri City, Texas area.